Electronic Cam and Control System for medium and high power gas, light oil, heavy oil and mixed fuel burners. Automatic Heating, has adopted an electronic cam and control system in its line of Enterprise burners. This innovative system, which has been divided into two types of flame control box, can be used for both commercial (from 140 kW) and industrial applications (up to 70 MW). Burners designed for use with a single or mixed fuel with continuous or intermittent operation and permits the command and control of all the various elements that plan a part in the correct mixture of the fuel and combustion air by means of an appropriately programmed flame control box. This versatile solution oriented to the future permits the achievement of the maximum precision in combustion adjustment. The system can also be expanded through interface with an oxygen control probe and/or a fan speed adjustment inverter in order to improve performance even further, in this way obtaining the highest savings in energy in terms of both the fuel and the electric power required. The command and control system is composed of a twin-microprocessor electronic unit for the integration of all burner command and control functions, and a local programming and adjustment unit. 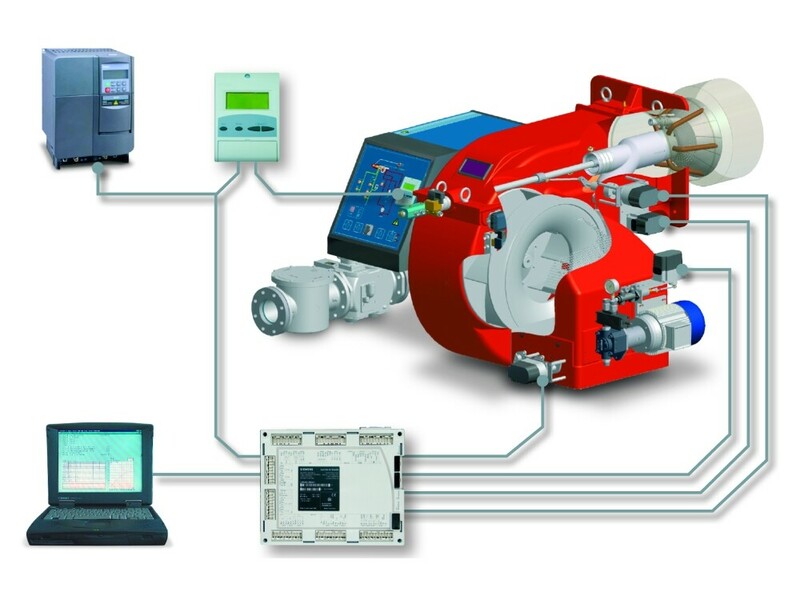 Integrated functions include air/fuel ratio adjustment (with work point configuration possibility), PID temperature or pressure regulator, gas valve leakage control, adjustable cycle times, pre-configured fuel trains and input/output configuration. The programming levels are protected by password for the three types of user (manufacturer, servicing personnel, final user); dialogue between the servocontrol and the sensors is performed using twin-channel CAN Bus protocol in order to guarantee the greatest safety and reliability, and the unit can be installed directly in the machine or inside a separate electric control panel positioned no further away than 100 meters. Using the appropriate designated optional software the system can be configured directly by PC.